My work with the tarot was born out of many things. It was born out of places of sudden transition, where fear and freedom and one and the same, and the recognition of and return to your own power becomes illuminated in the dark. It was born out of a seeking for a spirituality at the intersection of my identities, and a discovery of my voice. It was born out of a cultivation and sharpening of my activism, a deep and continued unpacking of internalized racism, and an orienting toward liberation. It was born out of death. It was born out of sitting in quiet by the ocean. It was born in moments of feeling on fire, and moments of feeling adrift. It was born out of rebirth in community. 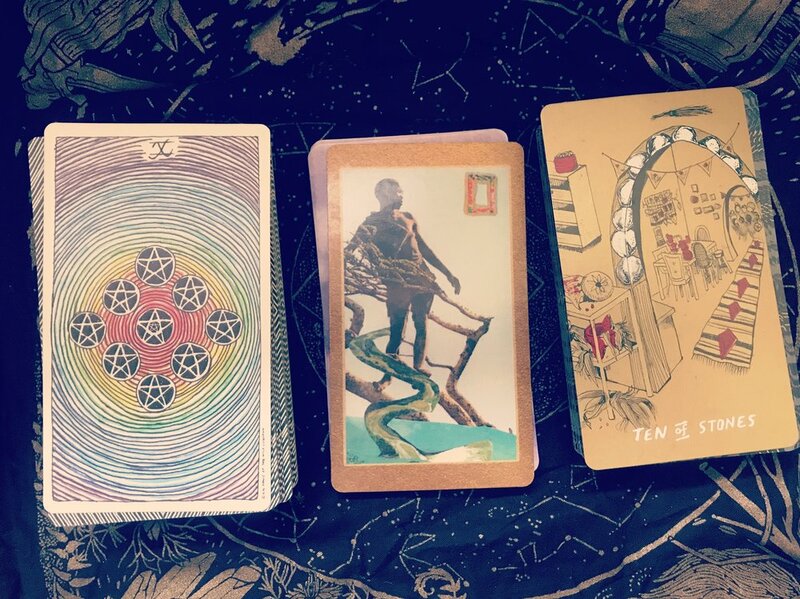 Tarot provided a space to seek, to interrogate, to intuit, to breathe, to activate, to access wisdom I already had access to. For these reasons, I ground my tarot readings in an intersectional and anti-oppression framework. This comes up in many ways, including carefully choosing the decks I use in my practice. For example, the cards I use may be designed by women, queer people, transgender people, people of color, and/or differently abled folks. The images on the cards might be nature-based or center brown and black folks. The artwork of the cards and story of the deck might illuminate and shift how our collective histories are told. Readings are for you and best done individually. Please feel free to audio record the session and/or take pictures of the spread at the end of the session. The reading can occur at my home in Ednor Gardens, or in the quiet corner of a cafe, bar, bookstore, or community space of your choosing. I hope your reading can provide you with the awareness you need to be your fiercest you. This is a ten-card reading to provide immersive and detailed guidance around a question. Can take up to an hour and a half for reading. This is a three-card reading to provide quick guidance around a question. Can take up to a half hour for reading. If you can give more, you can help to provide a free ten-card spread reading to someone without the funds. If you prefer, partial payment + exchange or full exchange is welcome and should be negotiated before the confirmed scheduling of the reading. Various kinds of healing work, tinctures, connection to partnership opportunities, and hearty houseplants are things I'd currently love. Schedule the reading by completing the form at the bottom of the page. I'll send you some possible times and dates and we'll go from there. Sundays tend to be best! "I recently scheduled a tarot reading with Blair and it was an experience unlike any other...in a good way! Honestly, I was hesitant to do tarot due to religious beliefs and uncertainty around what it was all about. I did some research and found that it was more about focusing on your life and bringing thoughts, decisions, and actions to the forefront of your mind that you may not have thought about before. It's really about meditating on the "right now" and having those dormant thoughts revealed. Blair was awesome on explaining how the session would go and what to expect. His knowledge of the cards and relating them to your life was quite impressive. I definitely recommend recording your session, as I have referenced it several times since we held ours. What surprised me is that this isn't a one-sided kinda session. Blair welcomed all the questions I posed and actually recommended that I read the cards out loud (after he did first, of course). This helped ensure that both parties understood what was going on. But it also allows you to speak to your life outside of your mind, if that makes sense and really put that energy out in the world. Afterwards, there is a feeling of motivation and clarity of the mind...well for me anyway! I highly recommend scheduling a tarot reading with Blair. You won't be disappointed." "Blair started the reading by both of us meditating, which was very relaxing. His reading is very interactive because before he explains each card, he asks you to tell him what do you see. He was on point. His reading resonated with my current situation. It was totally on target." "As a secular, skeptical person, I first went to Blair for fun three years ago, without spiritual expectation. Since then, I have developed a practice of meeting with him at least annually, seeking his empathetic services to find clarity, sort my thoughts, and heal from trauma. Blair has a calming energy, encouraging you to show up as you are--not forcing any particular dogma or "appropriate" way to engage the tarot experience. When setting up a session, he intentionally considers every sense to ensure a fully somatic experience so that the person can truly be in their body. Recently, Blair provided me a full tarot reading. At this time of year, I would usually be fully engrossed in seasonal depression, but I was compelled to visit with him. Blair's reading gently challenged me to settle into my strengths and trust my instincts. That visit was absolutely the type of mental health-driven, healing space I needed. I highly recommend the services of alight and Blair Franklin for everyone, including my fellow skeptics!" Thank you! I'll respond to your request shortly. Looking forward to connecting!